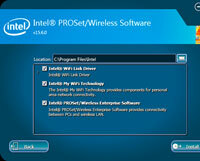 Intel PROSet/Wireless WiFi Software Version 20.120.0.4 WHQL. - Intel PROSet/Wireless WiFi Software and WiFi drivers driver package for wireless network adapters 802 WiFi a/b/g/n by Intel. Software Intel PRO / Wireless WiFi driver and are designed to work in the Windows 10.